Joanna Hope Red Print Multiway Kaftan is rated 3.7 out of 5 by 3. Joanna Hope – exclusive to us. 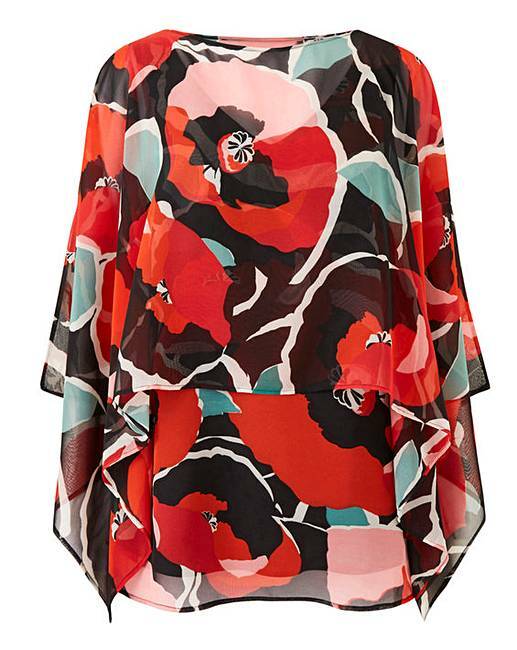 This fabulous vibrant poppy print kaftan is a really versatile piece. With a separate matching vest which the blouse can be worn with or without. The V-neckline vest is lined in a jersey knit and the kaftan has an on-trend cold shoulder detail. In soft georgette fabric, it looks gorgeous worn with our white linen trousers. Rated 2 out of 5 by Lynn from Sleeveless blouse with rectangle overlay This looks lovely in the photo, but it looked awful on me. Its a sleeveless blouse with a large rectangle which forms the overlay and is shorter than the blouse. I wish l had looked closer at the photo as where the top layer overhangs, it hung off my bust which detracted from the look. Rated 4 out of 5 by Tori13 from Lovely fit This is overall a fantastic top but the colours are not quite as vibrant as they look in the online photo, which was little disappointing. Rated 5 out of 5 by Tozermum from Elegant top Bought this recently. It is a good fit, lovely soft material, very flattering design. I am a lady of a certain age (66) and would feel happy wearing this. It is coming on a river cruise with me because it will travel well.